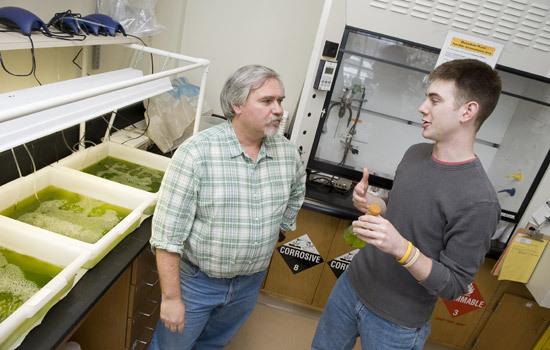 Professor Jeff Lodge and graduate student Eric Lannan explore algae as a biodiesel fuel. Let algae do the dirty work. Researchers at Rochester Institute of Technology are developing biodiesel from microalgae grown in wastewater. The project is doubly “green” because algae consume nitrates and phosphates and reduce bacteria and toxins in the water. The end result: clean wastewater and stock for a promising biofuel. The purified wastewater can be channeled back into receiving bodies of water at treatment plants, while the biodiesel can fuel buses, construction vehicles and farm equipment. Algae could replace diesel’s telltale black puffs of exhaust with cleaner emissions low in the sulfur and particulates that accompany fossil fuels. Algae have a lot of advantages. They are cheaper and faster to grow than corn, which requires nutrient-rich soil, fertilizer and insecticide. Factor in the fuel used to harvest and transport corn and ethanol starts to look complicated. In contrast, algae are much simpler organisms. They use photosynthesis to convert sunlight into energy. They need only water—ponds or tanks to grow in—sunlight and carbon dioxide. Cold weather is an issue for biodiesel fuels. Lannan’s graduate research in biofuels led him to Lodge’s biology lab. With the help of chemistry major Emily Young, they isolated and extracted valuable fats, or lipids, algae produce and yielded tiny amounts of a golden-colored biodiesel. They are growing the alga strain Scenedesmus, a single-cell organism, using wastewater from the Frank E. Van Lare Wastewater Treatment Plant in Irondequoit, N.Y.
Lodge and Lannan ramped up their algae production from 30 gallons of wastewater in a lab at RIT to 100 gallons in a 4-foot-by-7-foot long tank at Environmental Energy Technologies, an RIT spinoff. Lannan’s graduate thesis advisor Ali Ogut, professor of mechanical engineering, is the company’s president and CTO. In the spring, the researchers will build a mobile greenhouse at the Irondequoit wastewater treatment plant and scale up production to as much as 1,000 gallons of wastewater. Northern Biodiesel, located in Wayne County, will purify the lipids from the algae and convert them into biodiesel for the RIT researchers.